Spawn is the building/area where players spawn the first time they join the server. It is usually located at the center of the map, and it contains the rules of the server, the spawn nether portal, free food and other treats to help equip freshly joined players before venturing outside. 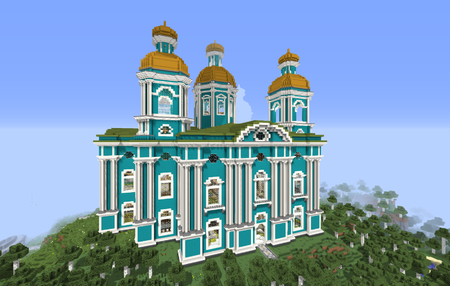 The Spawn building during Revision 13 was a replica of the St. Nicholas Naval Cathedral in St. Petersburg, Russia, and was the first Spawn to follow a brighter color scheme. Players spawned in the top floor, where all the rules and commands, the Protections Tutorial, the FAQ and other general and useful information about the revision were displayed on the walls. Following down the stairs, newcomers would find a series of trade signs that allowed players to obtain rarer blocks, and signs that would warp players to the lower spawn if they clicked on them. Something unique to this Spawn building is that its second floor contained a miniature reproduction of each and every Spawn building that preceded it. The Spawn Nether Portal was located at the very center of the bottom floor, alongside intricate rooms, beautifully decorated, each one with its own function and theme (from fantasy interior gardens, to gaming rooms, libraries, pubs and free food in the form of melons). This rev, Spawn didn't have a central Rail Station. Each cardinal road led to a Metro Station instead. This page was last modified on 15 March 2019, at 08:35. This page has been accessed 1,742 times.